(CNN) -- A leading international children's charity has warned that Elton John's desire to adopt a 14-month-old baby boy could lead to more children being abandoned. 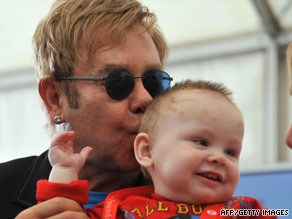 Elton John kisses baby Lev during his visit to the orphanage in Ukraine on Saturday. The singer, 62, made the announcement during a visit with his partner, 46-year-old David Furnish, to an orphanage for HIV-affected children in Ukraine on Saturday. "David always wanted to adopt and I always said no because I am 62 and I think because of the traveling I do and the life I have, maybe it wouldn't be fair for the child," he told reporters. "But having seen Lev today, I would love to adopt him. I don't know how we do that but he has stolen my heart. And he has stolen David's heart and it would be wonderful if we can have a home. I've changed my mind today." While EveryChild praised the British musician for helping raise awareness of children affected by HIV/AIDS, it said international adoption is sending out the wrong message. James Georgalakis, EveryChild's Communications and Advocacy Manager, told CNN: "Research conducted in the Ukraine in 2007 which showed high-profile celebrity adoptions and news around foreigners coming into the country and adopting children generally was actually encouraging vulnerable young mothers to abandon their children into homes hoping their child would be adopted by a rich foreigner and have a better life. "So it's quite well documented that these high-profile adoptions could actually be increasing the number of children in institutions." Do you think celebrity adoptions are a good thing? According to research by the charity's Web site, 95 percent of the children in Ukraine's institutions are not orphans, with babies born to HIV+ mothers facing particular discrimination. They are separated from their mothers and often end up in children's homes and institutions segregated from children not affected by HIV. It argues that governments such as Ukraine need to be encouraged to put more emphasis on keeping families together rather than placing them in outdated Soviet-era children's homes. "After a great deal of campaigning by charities such as ours, the Ukraine government introduced a new 'gate-keeping' system which means the authorities will have to consider all available options before a child is placed in an institution," Georgalakis said. "So when a child is taken into care or abandoned, they will have look at whether a child has other family or can be fostered by another family for example. This is a huge step forward and one that needs support. "We will definitely be speaking to Elton and his representatives about this." Elton John is the latest high-profile figure to be linked with a case of this kind. Earlier this year, Madonna won a court appeal to adopt a second child from Malawi. Critics of the pop-star accused the pop superstar of taking advantage of "archaic adoption laws" in a bid to adopt three-year-old Chifundo James. Madonna's initial attempt was denied because she did not meet a residency law that requires applicants to have lived in the country for some time before adoption. This condition was waived when Madonna -- and then husband Guy Ritchie -- adopted her first Malawian child, David Banda. The judge in that case said the interest of the child outweighed the issue of residency. Meanwhile, the British Association for Adoption and Fostering said around 4,000 children need to be adopted in UK each year, with many facing a considerable wait. BAAF Chief Executive David Holmes told CNN: "While Elton John may be considered too old under current guidance to adopt a baby in the UK, there are many children, particularly older children, sibling groups, children with disabilities, and children from black minority groups, all waiting for a family. "We'll certainly be reinforcing this message during National Adoption Week in Britain later this year."